Students - After reading today's poem, you may be thinking that I really do carry a rock in my pocket all of the time. I don't. But I want to. And I do think about doing so. And someday...I may. 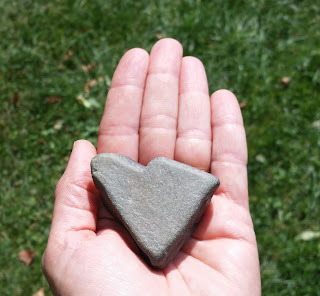 I do, however, love rocks, all kinds of rocks, and I adore the sound that a rock makes when it hits the road. Always have. Sometime earlier this week, I held a rock, and another time earlier this week, I hopped on a hopscotch board we found on a quiet sidewalk. The combination of these two things brought me to this poem. I enjoyed thinking about a secret tucked inside of a pocket and the idea that we do all have secrets and small treasures that others do not know about. What do you keep in your pocket? What secret might you share? A true one...or a pretend one? It's an honor to host Alexandra Zurbrick at my other blog, Sharing Our Notebooks, this month. Please head on over, peek into Ally's notebooks, and leave her a comment. You may just win one of her favorite writing books! The grand-girls have started playing hopscotch, although I'm not sure they ever think of keeping a special rock, especially one that's a 'heart' rock. I'll share this with them, Amy! Rocks have such distinct personalities, don't they? We used to spend time each summer on a lake in Maine that had a rocky beach. My kids and I loved combing the shore, looking for unique rocks. I still have a box of them in the attic. Now I'm want to go find them and see what treasures are lurking there. Thank you for the inspiration! In just a couple of weeks, I'll be meeting my new class and inviting them to do just this -- tell about and celebrate those unseen things that make you unique! You have a talent for capturing those special moments of childhood, like keeping a rock or playing hopscotch, but more than that, you give appropriate prompts for kids. I'm back in the classroom and will soon be writing poetry with my kids again. Your site will be a regular visit. Thanks. Rock on the road./Rock in my pocket. I just want to say those lines over and over! What a wonderful invitation to share! I think I'll be searching for my secret pocket treasure today. Have a marvelous weekend, Amy! "My Rock" is a delightful poem that would be great to read when teachers introduce the idea of carrying a poem in your pocket. Thanks for sharing, Amy. A cool rock and a poem that brings back warm memories. Thank you! Adorable without being too cutesy. Got me thinking about what sounds I love! I have pennies in my pocket that no one can see.....might have to say why in some poetry.